This entry was posted on January 24, 2013 by Andie Pantazi. Ever wondered why academic regalia are almost all the same in style and design but has different colors depending by the school and on some color codes? The meaning of academic regalia colors is set by academic institutions and a unified education council for standard coding and uniformity. The meaning of academic regalia colors only resides in two things- a student’s academic field of study and the official color of the university where the candidate is graduating from. In the olden days, there were no specific color requirements as to school or for each academic discipline. The academic regalia can be as magnificent or as simple depending on the wearer’s choice and it also depends on the wearer’s social status. The simpler it is, the lower the social status of that student is. If it is quite magnificent and intricate, it may symbolize that the wearer came from a noble well-off family. The academic regalia then were just some sort of “uniform” but with no specific set of guidelines as to how it should all look like. It also became an indication of one’s social status in the academic and social world. Nowadays, a definite institution sets rules for academic regalia that are mandated to be worn by any graduating student regardless of his or her social status. The academic regalia intercollegiate colors are set uniformly for each academic discipline and by school. The meaning of academic regalia colors is again defined by academic discipline and by school. This is now done to distinguish every academic level during the graduation ceremony to avoid confusion since graduation ceremonies per school are held all in one. From kindergarten, elementary up to high school depending on the schools available academic levels offered. Academic regalia colors are also different from school to school to distinguish their own graduates from other schools. The color is set in accordance to the school’s traditional choice. For kindergarten up to high school, the graduation gowns are usually colored by the school’s standard traditional color. For the college degree up to the doctorate degree however, the traditional color of their graduation gown is black but some schools require their college graduates to wear a colored graduation gown in accordance with their academic discipline or field of study. 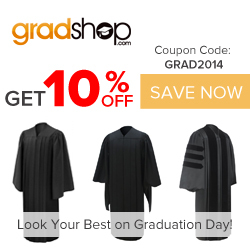 For the master’s and doctorate degrees, black is always the required graduation gown color. Only the gown linings, piping and hood linings contain the color of the school and their respective academic discipline. Colorful academic regalia look good in pictures especially when done in groups. It will always remind students of their school and academic discipline that they have worked on for so many years. The academic regalia are used in graduations to symbolize one’s academic achievement and academic excellence that a student pursued for a number of years. It exudes pride and prestige that is achieved after years of hard work and determination. It is best to follow the standard rules of academic regalia colors so that you won’t be the odd one out during the actual graduation ceremony! Andie Pantazi Andie is the Managing Director of Gradshop.com, a subsidiary of Apparel Group, and a leading online store of graduation regalia for all academic levels. She previously worked at a large textile company in UK and has been involved in several humanitarian advocacy like the Young Children Without Homes National Conference. Andie is a traveler by heart and has visited over 30 countries worldwide. She particularly likes Indian delicacies and is pleased with nothing more than a cup of Balma green tea to jump start the day.